LTS medium temp, high capacity reservoir pump Heavy duty pump designed for moving large quantities of water. Used in commercial and industrial air-conditioning systems, large refrigeration units, and multiple unit installations to tie several drains into one disposal pump. 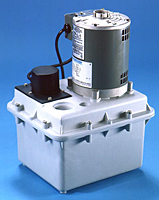 LTP medium capacity reservoir pump Designed for laundry and wet bar applications. Primarily used where the sink or appliance is installed below the plumbing drain. I would like to use an LTS pump in a basement wet bar application. Two questions regarding this installation. 1) the Hartell instructions show the vent line routed back to a laundry tub so that "soap foam" will dump into the sink. Since I'm not using it for a laundry application, can I just run a vent tube up to the underside of the counter and use an AAV? 2) will this pump handle the discharge from a dishwasher? I would plumb the dishwasher discharge into a tailpiece ahead of the sink trap, just as in a standard installation. Thanks! You can absolutely use an Air Admittance Valve on the pump vent in your application since there will be a minimal amount of soap being discharged into the unit. As for discharging a dishwasher into the unit, I do not see that being a problem as long as your discharge does not exceed 7 gpm. Let me know if you need anything else.